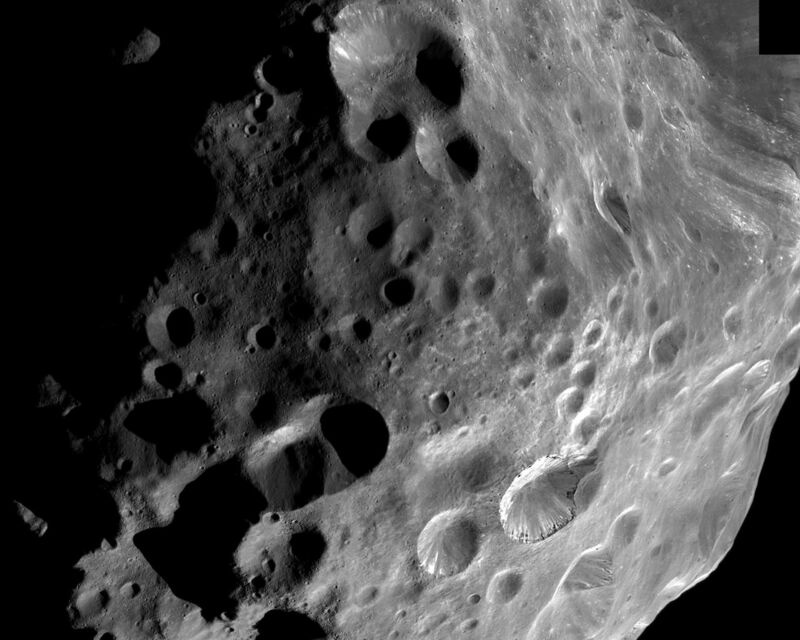 During its historic close encounter with Phoebe, the Cassini spacecraft captured a series of high resolution images of the small moon, six of which have been put together to create this mosaic. Phoebe shows an unusual variation in brightness over its surface due to the existence on some crater slopes and floors of bright material -- thought to contain ice -- on what is otherwise one of the darkest known bodies in the solar system. Bright streaks on the rim of the large crater in the North (up in this image) may have been revealed by the collapse of overlying darker material from the crater wall. The large crater below right-of-center shows evidence of layered deposits of alternating bright and dark material. A possible mechanism for this apparent layering was discussed in an earlier image release PIA06067. 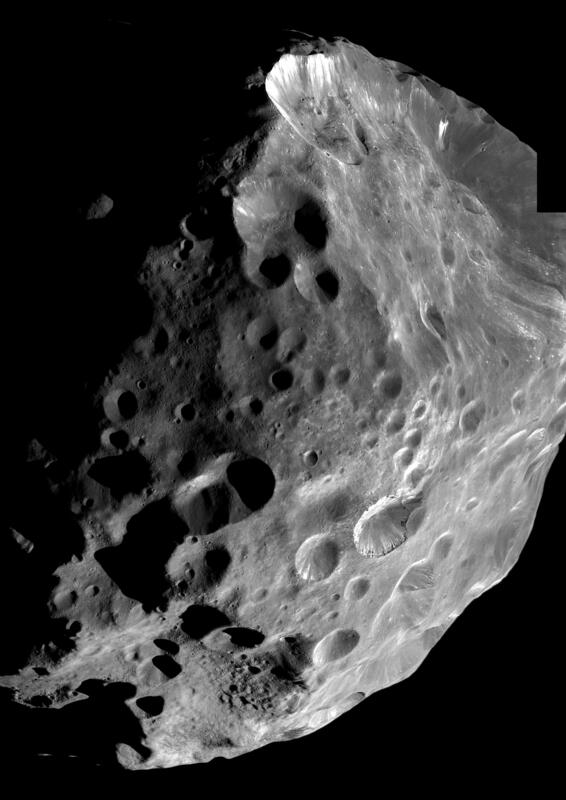 Hints of Phoebe's irregular topography can be seen peeking out from the shadows near the lower left and upper left parts of the image. These are real features -- possibly crater rims or mountain peaks -- that are just being hit by the first light of sunrise on Phoebe. 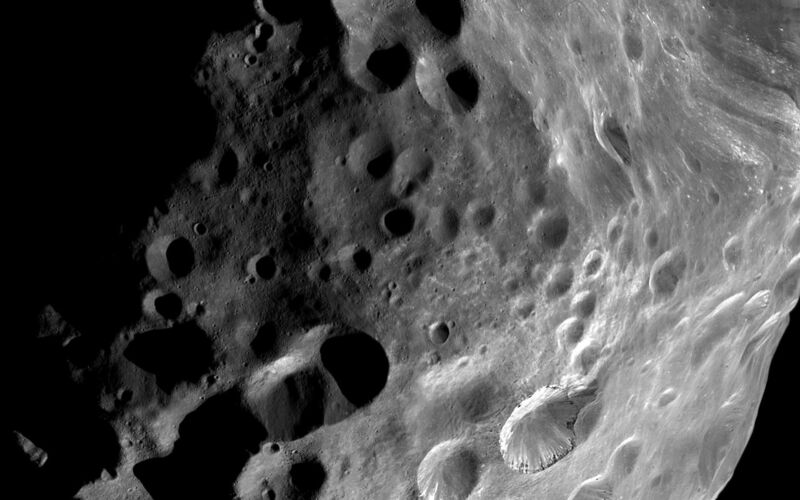 Phoebe's surface shows many large- and small-scale craters. 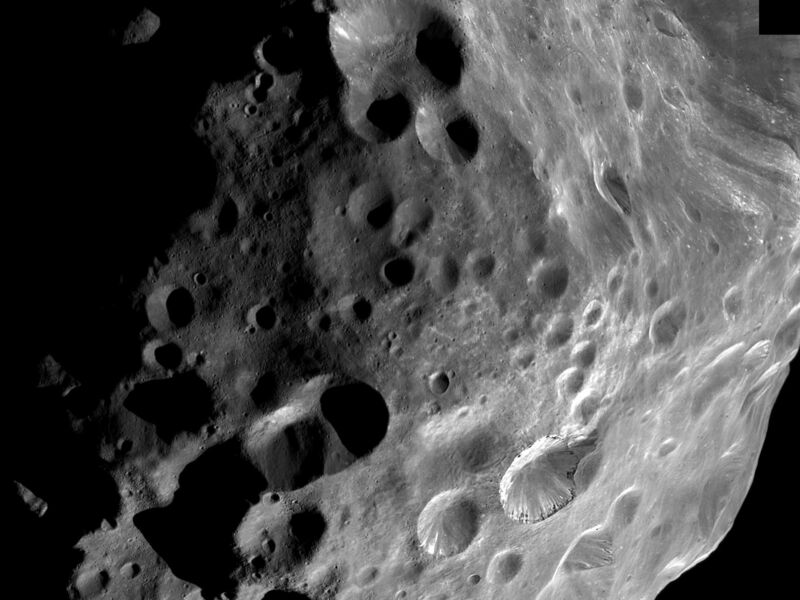 The emerging view of Phoebe is that it might have been part of an ancestral population of icy, comet-like bodies, some of which now reside in the Kuiper Belt beyond Neptune. The images in this mosaic were taken in visible light with the narrow-angle camera at distances ranging from 15,974 kilometers (9,926 miles) to 12,422 kilometers (7,719 miles). The image scale is 74 meters (243 feet) per pixel. Contrast in the image has been enhanced slightly to improve visibility.